I pulled into Cairo on a train early Sunday morning. It was the start of the Egyptian work week, and I was running very late to class at the American University in Cairo. As I rushed across town I had a lot on my mind. I was concerned about the heavy traffic around Tahrir Square, and about haggling with the taxi driver on such little sleep. I was also nervous about my Arabic presentation at 10 a.m. and a test I was taking later in the afternoon. I was not, however, worried about the general strike that would transform the country right before my eyes. That, I thought, was sure to go according to plan. The date was April 6, 2008 and Egypt was two and a half years away from unseating the oppressive Mubarak regime. Still, there was a sense that the people had had enough. The laborers in the Nile Delta were set to strike. Egyptian youth took to Facebook and other social media sites to support what was being called the Youth Movement. This time the voices of the people were going to be heard. That’s what we thought, at least. The best thing I could do as a foreigner was observe. When I arrived in Egypt a few months before the April 6 strike, every foreign student in my program was given the same simple set of instructions: “Stay out of it!” We were told that the policies of the Mubarak regime were not our issue, and that change must come directly from the Egyptian people. It was constantly stressed that I was simply passing through this society, and I was not to participate in any political activities. We were told to treat the politics much like the museum exhibits just off Tahrir Square: look, but do not touch. When I arrived at AUC that morning of I saw something that was far more foreign to me than the language or the food. Tanks were rolling in the streets. 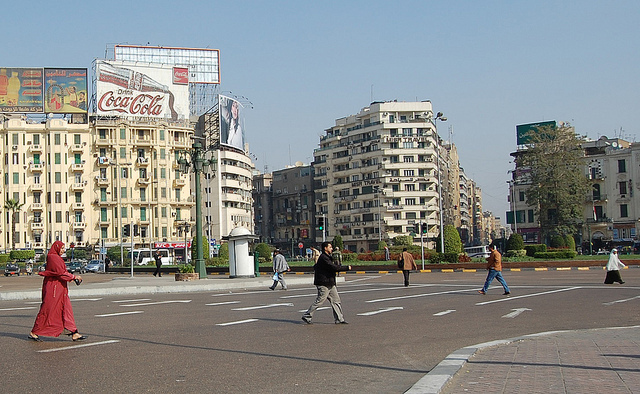 The roads leading to Tahrir Square were filled with armored cars. We could only guess what the square itself looked like. Banners? Megaphones? Endless lines of protestors taking up the cause? I eagerly went to the roof of the science building on the AUC campus to get a better view of the activity below. What I saw was far from a popular uprising. Hundreds of security forces stood in perfect formation. Their helmets were polished, their riot shields raised, and batons at the ready. After so much build-up there was not a single protestor in sight. The people had taken to the street in factory towns to the north, but the heart of Cairo was completely silent. There would be no revolution today. Foreign students were instructed to remain inside our homes, but I wandered down into the square looking for some explanation or reason for this lackluster performance. After a few minutes I came across a Spanish language reporter desperately looking for a story. It took us only a few moments to conclude I was not his lead. This happened a few more times with reporters from around the world. There was a story to be told, but it wasn’t in Cairo. It was in the northern factory towns where workers were standing up against low wages and skyrocketing bread prices. We had come to see a revolt. Instead oppression marked the day. Yes, the general strike had not had a special goal of revolution, but my expectations had been higher. It was obvious to me that the Egyptian people should revolt and fill the streets. This country desperately needed democracy, transparency, and above all else freedom of expression. These were both universally desired and universally deserved liberties, right? I realize now I was just impatient. The day was not a complete loss by any measure. Conversations that started in the weeks leading up to April 6 continue today. In the weeks following the general strike I found that the tone on campus had changed as well. Topics that were once discussed with a wink and a nod were now being talked about in the open. We had the luxury of the academic bubble, but that could not completely account for the change in the discussion. Egypt was not at the end, but rather the beginning of a wave of unrest that would transform society. As the bread shortage and labor disputes deepened in the world’s most populous Arab country, the youth were speaking out–and they were starting to be heard. On Facebook, the April 6 Youth Movement picked up 64,000 supporters. The general strike, underwhelming as it was in Cairo in the face of the government’s display of force, helped set that stage for the revolution that would follow. In hindsight I find myself lucky to have witnessed those events. I eagerly await the next chapter in Egypt’s history. Iain Padley is a Coro Fellow in Public Affairs at the Coro Center for Civic Leadership in Los Angeles. He is a graduate of Richmond, The American International University in London, and an avid traveler with a strong interest in North African cultures. *Photo courtesy of Pixel whippersnapper.